Special Containment Procedures: Personnel interacting with populations of SCP-3209 are to wear liquid-crystal active shutter glasses operating at or above 60 Hz. Wild specimens of SCP-3209 are to be captured and relocated to an on-site lepidopterarium. Monasteries keeping SCP-3209 populations are to be closely monitored for specimens escaping into the wild. Description: SCP-3209 (Sevenia acedia) is an anomalous species of butterfly which preys upon interest. An SCP-3209 specimen feeds by perching on the nose of its target and rapidly fluttering its wings in front of their eyes. Affected animals become lethargic and unmotivated, eventually dying of starvation. Sapient beings exhibit a more complex set of symptoms when exposed to SCP-3209. The primary effect is permanent loss of interest in a hobby or topic. Examples of interests lost due to SCP-3209 include card games, poetry, science-fiction films, and golf. Frequent exposure to SCP-3209 causes chronic anhedonia and apathy. 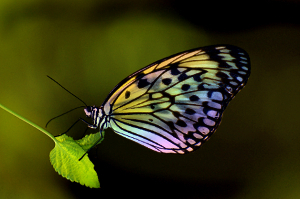 As most symptoms of exposure are nearly indistinguishable from dysthymia, attempts to locate wild populations of Sevenia acedia have primarily focused on tracking down reports of rainbow-winged butterflies. In severe cases, individuals continually exposed to SCP-3209 may be identified among patients in psychiatric care facilities. Such patients typically have no prior history of behavioral incidents, live outside of cities, and are hospitalized following suicide attempts which failed due to their lack of motivation. The Ethics Committee has indefinitely postponed actions against monasteries in and around Nepal, an unknown number of which may be maintaining populations of Sevenia acedia in secret. Internal discussions center around the testimony of field agent Aaron Bartell, who was assigned to identify and investigate monasteries involved. Might have a lead. An ex-monk in Panauti with severely disabling apathy. Can't even get out of bed. Probably a straightforward case of depression, but his nickname caught my eye. Apparently people call him the Butterfly Man. Met the Butterfly Man. Real name: Rajiv Śākya. Couldn't get a statement from him—he had no interest in conversing. As far as I can tell, he has no interest in anything. Borderline vegetative. I did obtain the name of his former monastery from one of the neighbors taking care of him. Tergar Gompa. Located in a valley a few kilometers east of here. Hoping this doesn't turn out to be one more dead end. I haven't seen my family in, what, four months? Tergar Gompa is beautiful. It's surrounded by Persian silk trees, the ones studded with pink flowers. The monastery itself is an arrangement of pale stone buildings around a courtyard. The buildings are connected by colonnades painted in rich hues, mostly red and gold. At a guess, I'd say the place is three or four centuries old. And to think, I almost took a desk job. The monks weren't thrilled about my liquid-crystal glasses. Cameras are banned here—not sure whether due to religious beliefs or more practical concerns. They spent a few minutes looking over the glasses before returning them. Conveniently, they didn't bother to inspect my books, which contain a small arsenal of surveillance equipment. I don't think they were feigning ignorance about the glasses. If they're not using active shuttering, how are they protecting themselves? Blindfolds. I've only caught a few glimpses of blindfolded monks, but I'm sure of it. Somehow they're doing all the work of caring for the butterflies by sound and touch alone. The caretakers might not even know what they're dealing with. I've been watching out for any monks behaving unusually, but nothing so far. Whatever SCP-3209 is being used for, it must be pretty limited. There might only be a handful of monks here aware of its effects. First sighting of Sevenia acedia. Not hard to find. They're kept in a small glass-roofed conservatory built against the southern wall. Small population, from what I could see. Maybe three dozen or so. Hid some cameras in a few nearby bushes to keep an eye on things. Next morning, four men in blindfolds visited the conservatory. I want it on the record that I have never been wrong about anything, ever. I fit in fairly well around here. I guess working for the Foundation has given me plenty of practice at the whole taking-yourself-out-of-the-equation thing. Emotional distancing, constant self-analysis, ego starvation, etc. Difference is, at the end of the job I get to go home and be me again. Hard to imagine living like this all the time. Inadvertently exposed myself to SCP-3209. Woke up, opened my eyes, and the little fucker was perched right on my nose. The shimmer in its wings got me before I could look away. When I regained focus, it was gone. Must have zipped right out of there as soon as it was full. From now on, will wear the glasses to bed. Need to figure out how it got in my room. Maybe the monks suspected I was on to them. Maybe they'd have thrown me out if the butterfly returned hungry. Maybe I'm after any excuse to frame my mistake as a good thing. I keep getting distracted trying to figure out what it took from me. Reviewing all my hobbies. 'These are a few of my favorite things'. What's missing? What don't I care about anymore? Just noticed the carpets in the prayer hall. They're full of butterflies. Every single pattern, every border design. The monks here meditate on their knees with their heads bowed. The whole time, they're staring at butterflies. I've been looking at this all wrong. Forest for the trees. I haven't seen any out-of-place behavior because this whole place is about SCP-3209. They're all in on it. I was right. Late last night, the Sevenia acedia were transferred in a box from the conservatory to the prayer hall. All of the monks gathered inside the hall. No guests allowed. My cameras couldn't get a clear visual due to poor lighting—there was only a dim, flickering glow cast by floating candles in frosted-glass bowls. Audio came through just fine, though. Each monk recited a different phrase over and over. "Longing for my childhood home." "World politics." "The cuteness of dogs." "Showtunes, for getting stuck in my head." It was like a confessional. The ritual lasted roughly half an hour. When it was over, they returned the butterflies to the conservatory and went to bed. I've been thinking a lot, these past few days. Reflecting. Everything about this place encourages it. The windows at the ends of corridors; the neatly trimmed grass in the courtyard; the flickering candles. There's a kind of stillness here that gets inside you. I tend to think of myself as an impartial observer. The Foundation concerns itself with facts, and facts do not depend on perspectives. I'm starting to wonder whether that was naive. I knew the facts of monastic life here perfectly, but until two days ago, I failed to grasp their impact. Facts: Monasteries like this one strive for three mental states. Amoha, non-delusion; adveṣa, non-hatred; and alobha, non-attachment. Emotional ties to worldly matters are considered poisonous. Impact: Is it only because of my cultural biases that SCP-3209 appears harmful? Where is the line between apathy and alobha? Is Rajiv Śākya a victim, or has he approached enlightenment? My instinct is to recommend capture of all cultivated populations of Sevenia acedia and administration of amnestics to everyone involved. It would be simpler; cleaner. It would also be an inexcusable mistake. These populations are already contained. They pose no threat to civilians. We have no justification to destroy the centuries of tradition and history that have developed at monasteries like Tergar Gompa. If we erase every part of human culture capable of harm, will anything be left? Got home today. I'm still adjusting to how much warmer it is here. My son was so excited to have me back. He's been making all these little finger-paintings. I didn't care about them. I didn't care about anything he said or did. I've always been overjoyed to see him after a long trip. No matter how hard I try, I cannot find that feeling now. My son is only four years old and I have lost interest in him. That's what SCP-3209 took from me.